I transcribed the reply yesterday that my grandmother received from her letter to the army’s adjutant general’s office seeking information about Babe’s service in the military. But I forgot: I have the letter my grandmother sent, too. More than a year had passed since Babe died when she wrote this letter—and she still didn’t know where he was buried. 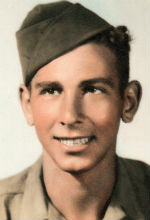 I would like some information regarding my son, T/5 Frank D. Mauro, 32 810 329, 168th Infantry, 34th Division, who was killed in Italy May 4, 1945. Please send me some record of his campaigns and battles. It seems I never heard anything from any of his company commanders about his battles—much less about where in Italy he is buried. I would appreciate some special attention on the latter. Note about the picture above: My grandmother is the short woman in the back. Starting in the front, the rest of the people are (L-R): My mother, Rosemarie, my brother Steven, my Aunt Dorene who is married to Babe’s brother Vin. Back row: Bob Mauro, Babe’s brother, and my father David.